Make cutting your wedding elegant and classic with our Engraved Wedding Cake Serving Set. Using these beautifully knives will be sure to make your photographed moment much more memorable. 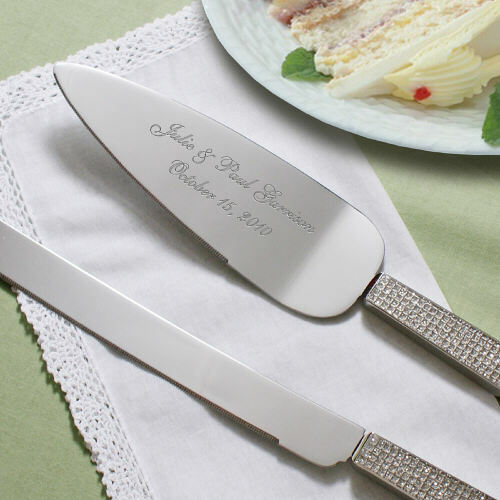 Our Personalized Wedding Cake Server and Knife set is available on our Glitter Galore Serving Set, that features sparkling rhinestone accents. The cake knife and server each measure 12 3/4"L. Includes FREE Personalization! Personalize your Wedding Cake Server with any two lines of personalization. It’s a wedding gift for my Grandson and wife to be I’m very sure they are going to love it as much as I did when I saw it. Personalized Romantic Gifts and romantic gift baskets make the finest romantic gifts for her. Looking for romantic gifts or Personalized Anniversary Gift Ideas for your wife, then look no further. We have a large collection of unique romantic gifts for your special loved one!